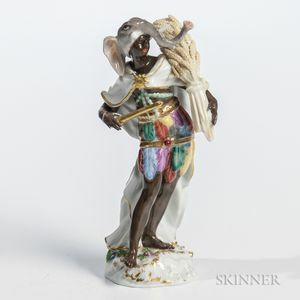 Meissen Porcelain Allegorical Figure of Africa, Germany, 19th century, polychrome enameled and gilded model wearing an elephant headdress and carrying a sheaf of wheat, a lion to the front of the freeform base, underglaze crossed swords mark, ht. 5 3/4 in. Missing one tusk, one finger, end of baton, slight loss to another finger tip, break and simple repair to one wrist, shallow chip to back edge of base.